Someone mentioned Saskatoon. Not really sure why, or how it was relevant to the daily adventures of the Planning & Development Department of the City of Surrey, but alas Saskatoon was mentioned. Then, later in the day, whilst still laughing, we googled it. 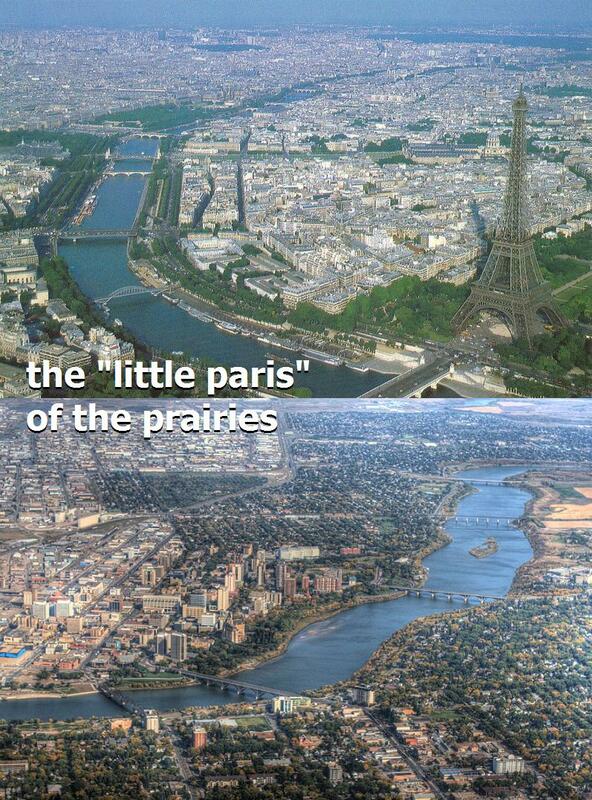 The one with the Eiffel Tower is Saskatoon. Wait… I may have that wrong. Touche, Saskatoon, touche. We stand corrected. Having lived my whole life in Saskatoon, I can say that you have described a typical visitor’s experience here. At first they are doubtful, sometimes downright amused at how much we love our city. Then they see an indie rock show at Amigos, a sweaty DJ set at scratch, drink their last beer as the sun comes up along the river bank, and they’re convinced. 🙂 much love. I have lived across Canada and still find Saskatoon to be one of the most beautiful cities in Canada. Just need to work on the density and the city will be set! Saskatoon – la ville des lumières nordiques est une ville de l’amour et de la paix pour ceux qui cherchent de telles choses !